This is your ultimate guide to the best places to visit in Anuradhapura. This list is perfect for a 2 to 3 day itinerary and don't forget your camera! Anuradhapura is a cultural and historical delight. And it was a must-have stop on our chosen 3 week Sri Lanka backpacking route. It’s one of the most ancient capitals of Sri Lanka, which makes it no surprise that it’s gained a UNESCO world heritage site title. The area is bursting with things to see and do, and below we take you through the 13 best places to visit in Anuradhapura. Bit first, here's some answers to the most common questions you might have when planning your trip. When is the best time to visit Anuradhapura? The weather in Anuradhapura is mild and warm. This is especially so in the month of May when the normal temperature is 29.0°C. The warmest month is March when the temperature rises to 33 C.
Bradley and I visited in September and the weather was warm, but there was no rain or cloud which was nice. I think it's possible to visit all year round with ease. It depends on how much heat you can handle! How long do I need to stay in Anuradhapura? What are the best ways to reach Anuradhapura from Colombo? First things first, people tend to land in Colombo, so this makes it the starting point from getting to Anuradhapura (unless you’re planning a Wilpattu Park safari beforehand ... which you should!). Bus: The bus from Colombo to Anuradhapura stops at Putlam and you’ll need to transfer onto another bus. Buses are very cheap in Sri Lanka and it shouldn’t cost more than 200 rupees. Train: The train from Colombo to Anuradhapura is the most budget-friendly and quickest way to get to Anuradhapura. It costs around 80 to 270 Sri Lankan Rupee and takes around 3 and a half hours. Taxi: You can get an uber to Anuradhapura because you’re leaving from Colombo where the uber hub is. It takes around 4 hours and it costs around £30-£40 pounds, which between 4 people isn’t a bad price for aircon and convenience. 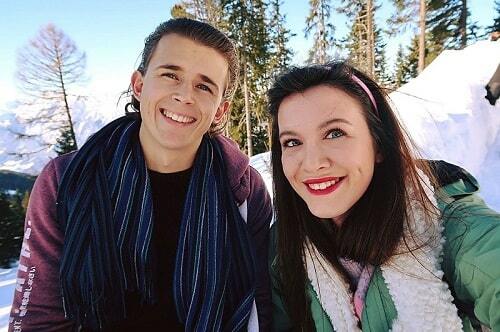 ‍Tuk-tuk: This is the option Bradley and I chose. We rented our own tuk-tuk from Colombo for 4 weeks and used it to drive all across the island. The drive from Colombo to Anuradhapura is around 5 hours. The flexibility that a tuk-tuk brings to your travels is amazing. It cost us $18 a day and we could go “off the beaten track” whenever we pleased. What are the best places to visit in Anuradhapura? 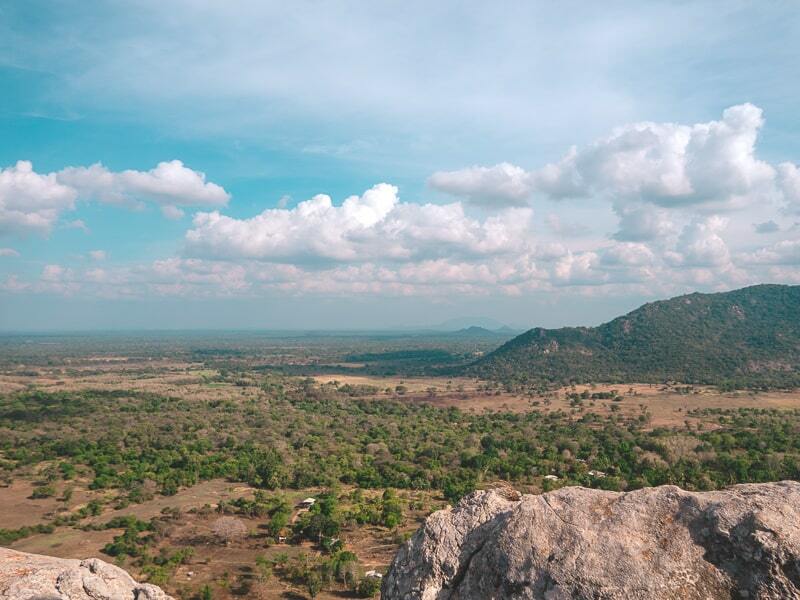 Anuradhapura is bursting with great things to do and see and to make life easier for you, I’ve put together a list of the 13 best places to visit in Anuradhapura. A lot of the sights (the majority of them) require a UNESCO cultural heritage pass. This costs: $25 USD and are sold at the Archaeology Museum (open daily 8:30 a.m. to 5:30 p.m., closed Tuesdays). However, I will start with the sights that are not included in this ticket and work my way through. Basically, if there is no price, then it's included in the cultural heritage pass. I thought I’d start with my favourite place to visit in Anuradhapura. Mihintale is a sacred area that is accessed via steps. It’s a mountain or (hill) and the climb up is via a dodgy railing so be careful with your footing. What makes this place sacred is that it is believed that this area is the specific birth of Buddhism in Sri Lanka. This is because it’s thought that Buddha flew from India and landed on top of this rock, thus bringing the religion to Anuradhapura. It’s located around 13 km from the centre of Anuradhapura (which takes around half an hour by tuk-tuk). If you don’t have your own, then hire one to take you there as it will be the cheapest way. Views from the top are beautiful, but it is WINDY, like crazy windy, and the little top viewing point can only fit 4 or 5 people max at a time, so it’s important to get there when it's not too busy. Be aware of the monkeys everywhere. It’s 500 entrance, but that includes entrance to the other religious sites within the area, including a beautiful big white Buddha on a hilltop. You will also need to cover your shoulders and knees and remove your shoes to enter the full area. I recommend socks (especially if you are type 1 diabetic like me), and if you forget a wrap, you can get one for free at the bottom. This place is famous for a sacred tree growing out of the middle temple. It’s a very serene place and it’s free to enter which makes it one of the best places to visit in Anuradhapura if you're sticking to a budget. If you’re interested in seeing how locals pray and generally experience a simple temple, then this is the place for you. Read Also: Bradley's guide on the best surf spots in Sri Lanka. Part of the temple holds a room that has beautiful stone carvings, and one of the most famous is the “lovers” carving, which I got a picture of. These carvings in stone are truly fascinating because they are so old. 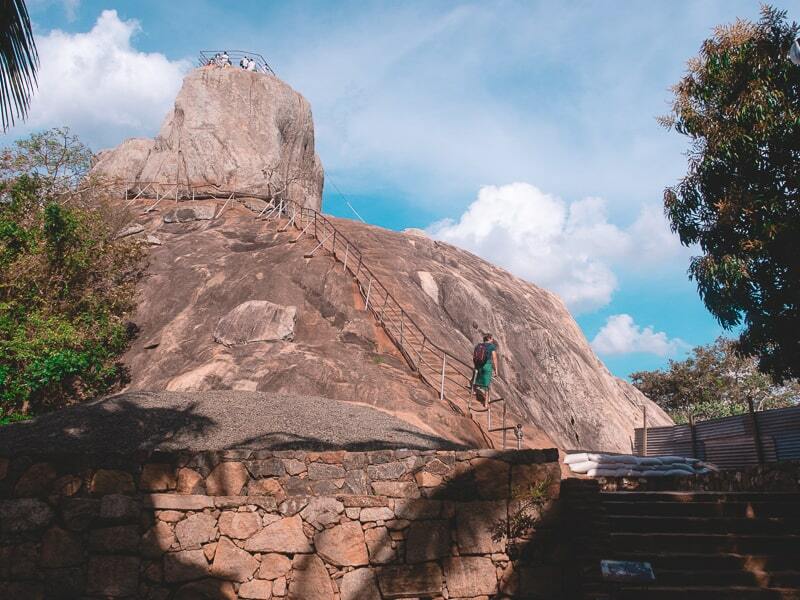 You can also climb around the back of the rock to the summit and to see a bell-shaped stupa. It offers nice views, and you will see lots of locals praying. As you enter it suggests you should only wear white in the area out of respect. However, this applies to those who are praying and there for religious reasons. You could spot the foreigners, as they weren’t wearing white, and I couldn’t have possibly worn brighter colours if I tried! These are situated literally a 2-minute walk from the above sight and it's free to enter. They are also close to public toilets which are clean! Anyway, as you walk through these gardens, it's surrounded by historical ruins which makes it fascinating. Unfortunately, however, there is limited information on what they are, or what they could have been, so I felt like I missed out. Another reason a guide might be useful. If you do want to hire a guide for the day, it should be somewhere around £5-10 pounds depending on where you want to go, so it can be useful. This was once a “jewel palace” that now mostly lies in ruins. It was originally 7 stories high. The entrance is the most impressive feature with a beautifully carved muragala (guardstone), which showcases the Cobra King holding a vase of abundance and a flowering branch. 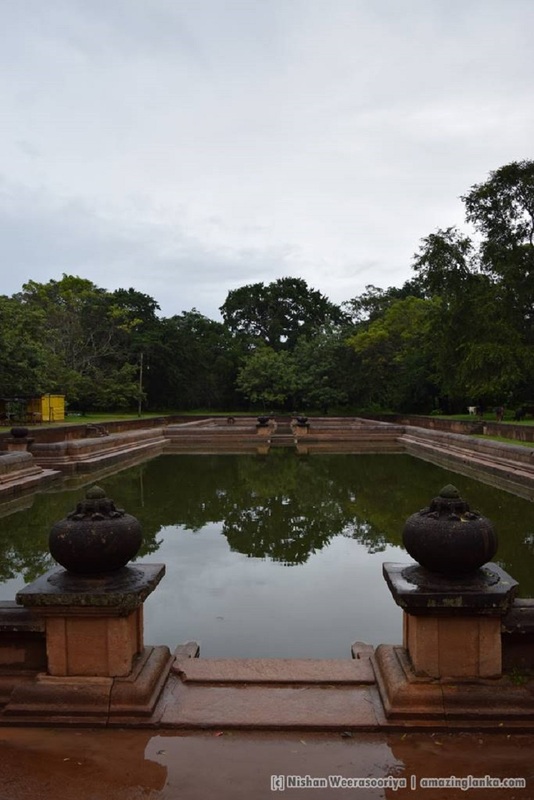 Kuttam Pokuna, known as the twin ponds are an engineering marvel of the ancient Sri Lankan era. They belong to the Abayagiri aramic complex and probably been used by the monks for bathing. We don't know the origins of these ponds, however, it's thought to have been built during the reign of King Aggabodhi I (575-608). This dagoba dates back to 1st-century bc. It was originally over 100m high and was once regarded as one of the greatest structures in the ancient world. The only thing that could match it at the time was the pyramids of Giza. After various reconstructions, it now soars 75m above the forest floor. It's one of the best places to visit in Anuradhapura for its visually stunning beauty and you can find your first glance of this via a gap in the forest that surrounds it. Also, did you know the name means ‘Fearless Hill’? An absolute wonderous stupa built by King Dutugemunu c. 140 B.C. It’s considered one of the most sacred areas for Buddhists all over the world. 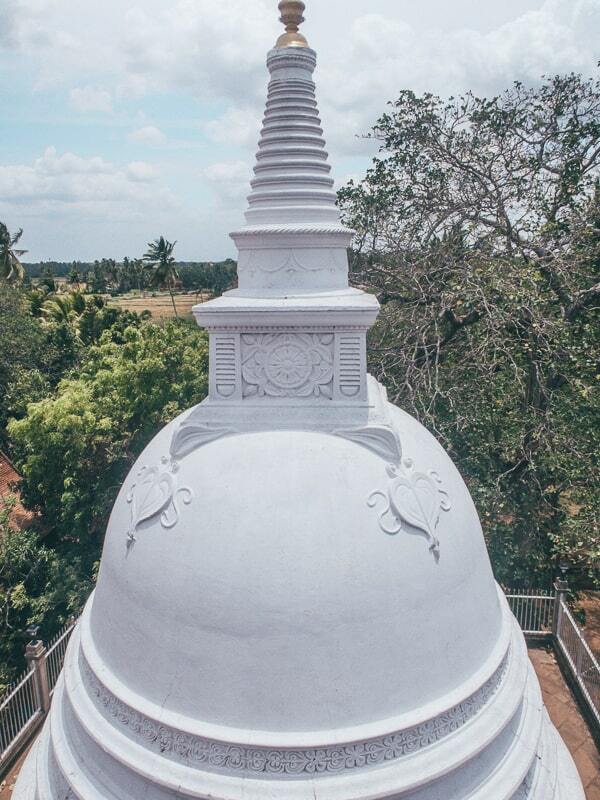 It’s the oldest stupa in Sri Lanka, and was restored in the 20th century and repainted a glorious white. It truly is regarded as a marvel for its architectural qualities. 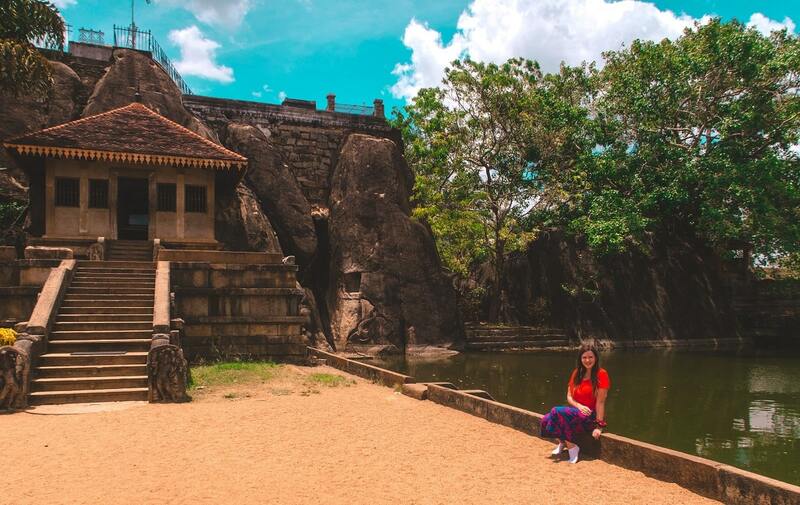 As with a lot of ancient sights in Anuradhapura, you have to be able to appreciate the context in when and what they were built to really appreciate the greatness. If you are unable to do this, then you’ll struggle to find the beauty. This is why getting a guide can sometimes be useful, or using a lonely planet guidebook as you walk around! I say lake, but it’s actually an artificial reservoir. It’s called Tissa Wewa and it’s a nice place to catch sunset because you can see the two glorious white stupas in the distance. Also, if you want to experience something different, it’s also bath time for locals and over 100 people come here to get washed! 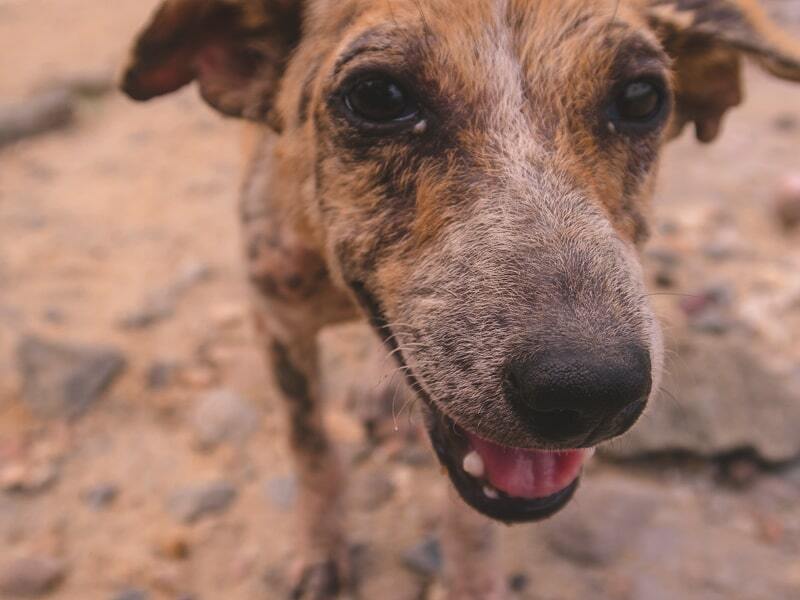 Ps, all over Sri Lanka there are stray dogs, did you know that there are more dogs than the population itself. This means lots of them to die of ill health and there are very little facilities to help them. We found a dog on the beach next to this lake, and she looks like this. If you ever see her, please bring her food and water. We were only there for 3 days but we went twice a day with food and she is super friendly and kind and just wants love. She is clearly sick, so don't let her play with you if you're not covered, but I couldn't save her, so if you go to Anuradhapura and want to help her, message me and I will give you exact details of where she is. 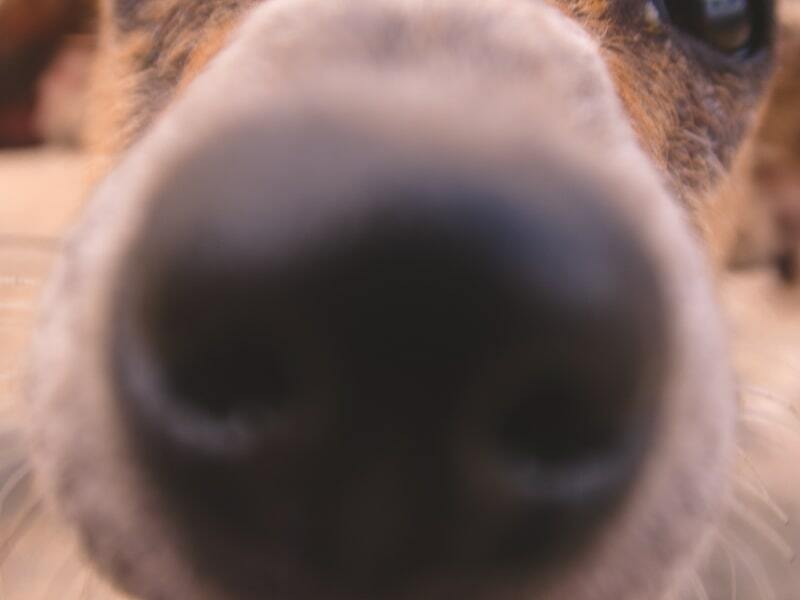 We had lots of cases like this over Sri Lanka, but this is the first dog Bradley and I connected with, and we fell in love with her. 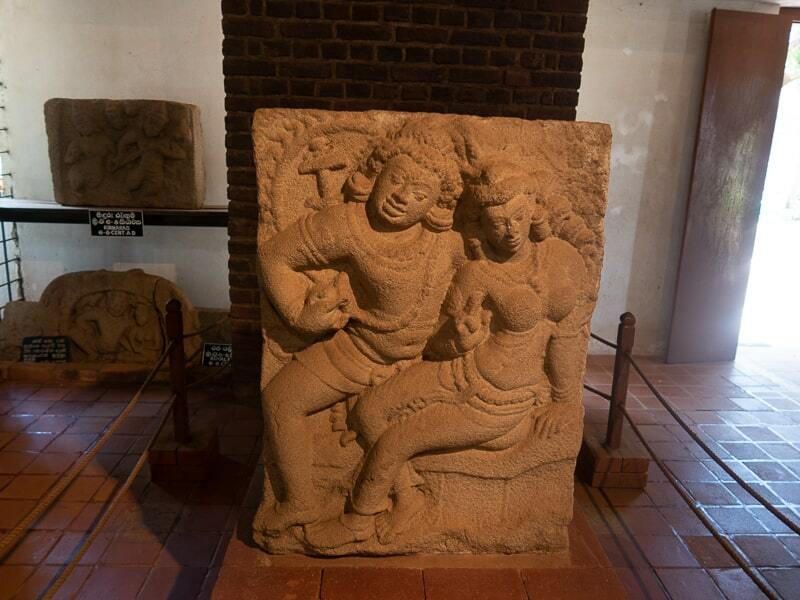 She herself is one of the best places to visit in Anuradhapura. Anuradhapura isn’t exactly bursting with amazing places to eat, but Tripadvisor will recommend Mango Mango and you should go. Not only is it stupidly cheap, but it’s a nice aircon restaurant, modern design and it’s a chain of 4. But the food is AMAZING, big portions and just fantastic value. I can’t handle spice, so I recommend the butter chicken and chicken korma alongside a portion of cheese dosa (amazing). If you are looking for snack food there is a modern looking shopping centre in the main area of town. It has an “in-house” restaurant that serves cheap food including sandwiches, subs and local rice and curry dishes. It’s super cheap too. If you can appreciate work completed in the past which would have been challenging, then you’ll appreciate this. If you travel 3,4 km from Sangamitta Mawatha, you’ll pass by some picturesque paddy fields, you can reach the point where this ancient stone bridge crosses the Mawathu Oya. Only part of this stone bridge can be seen today, and stone slabs are laid across rows of 3 stone pillars. Attempts have been made to restore this bridge in the recent past but work has been abruptly stopped in 2001. The stone bridge dates back to 5-9th centuries. This is a Buddha which is situated in meditation pose and it’s super old...I am talking the 4th century. 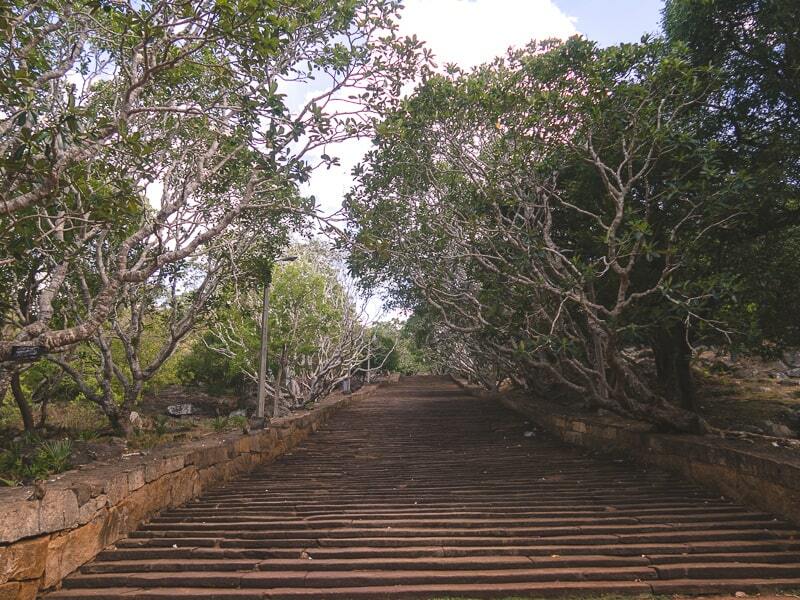 So, if you like history, then this is one of the best places to visit in Anuradhapura. 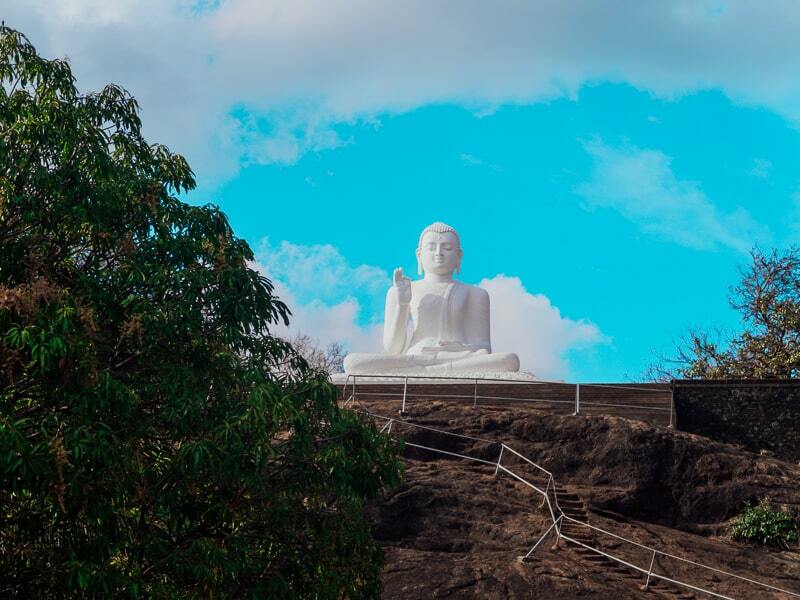 Due to its significant age, it’s regarded as one of the best Buddha statues in all of Sri Lanka and it’s thought to have been constructed at the cardinals directions. It’s carved from granite and is 8ft in height. It’s located in Mahamevnāwa Park which is also worth a wander too. 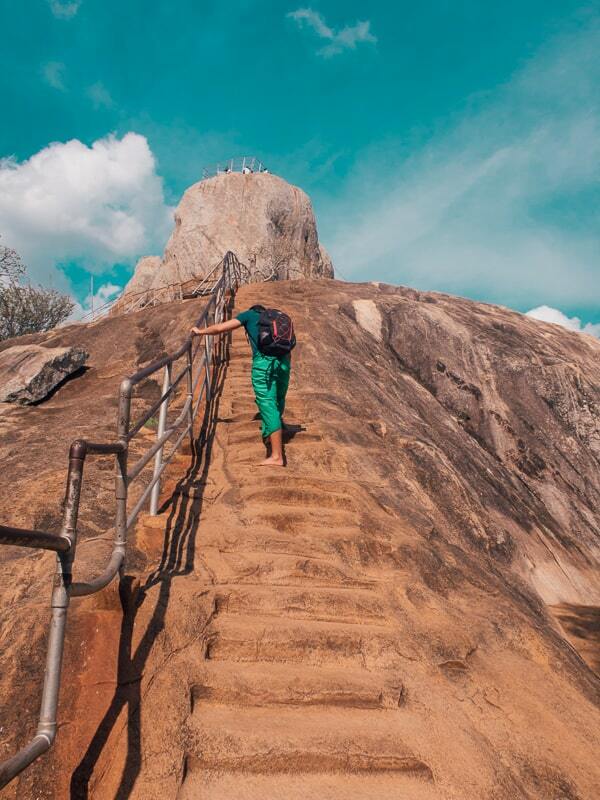 We have a whole post dedicated to what to do in Sigiriya, and people do visit the famous Lion's Rock from Anuradhapura, but it will be a full day trip, and we recommend leaving super early; because it’s always nicer to climb lion rock when the crowds are lower and the weather isn’t scoring hot. This is because most of the climb isn’t protected from the shade, and the more people, the longer you will have to wait to use the narrow stairs that lead up to it. 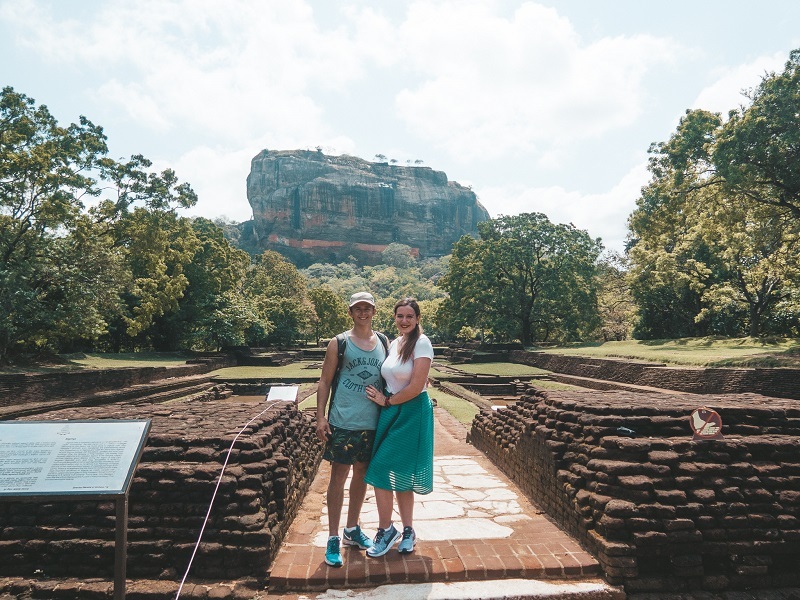 It’s about a 1 and half hour journey to Sigiriya from Anuradhapura, but if you’re only in Sri Lanka for a short time, then taking the trip from Anuradhapura is the best way to do it. On your way back you could also stop at Dambulla and visit the cave rock temple. Entrance into lion rock is $30. There are lots of great accommodation choices in Anuradhapura, and we stayed in a wonderful guest house. It cost £10 for a double room. The hosts were generous and lovely, the rooms clean and comfortable and the wifi was good. Every evening she made us a pot of tea with cream, and to this day, it was the best tea I’ve ever had. She also did washing for us for 300 rupee, which is around 1.50- that is stupidly cheap. We never found it cheaper elsewhere. We always use booking.com to book for accommodation. Thankfully, I've completed a whole post on the best places to stay in Anuradhapura, so I am sure you will find something to suit your preferences and budget there. If you want to get yourself a Anuradhapura tourist map to help navigate your way around the city then you can get one at the ticket counter from where you buy your heritage pass. If you aren’t buying a pass, then you can ask your accommodation if they have one. The distance between the different heritage sights in the old city are quite far and you may find it tiring to walk. This is why it’s recommend to rent a tuk tuk for the day to take you around. You won’t get ripped off, so just go for a decent price and you’ll be sorted. There isn’t also someone at the entrance of the sites, so you can kind of just wander in, BUT, there are random guards hanging around who will ask you for proof of your purchase and you’ll need to be able to show it or else a penalty occurs. Some people get away with visiting some of the sites without paying, but it’s up to you and your moral judgement. 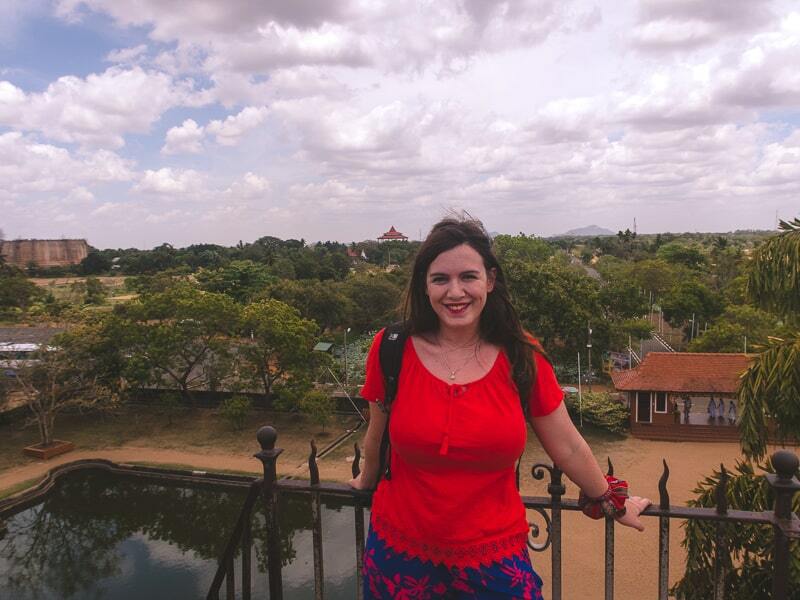 I hope you’ve enjoyed this guide on the best places to visit in Anuradhapura. 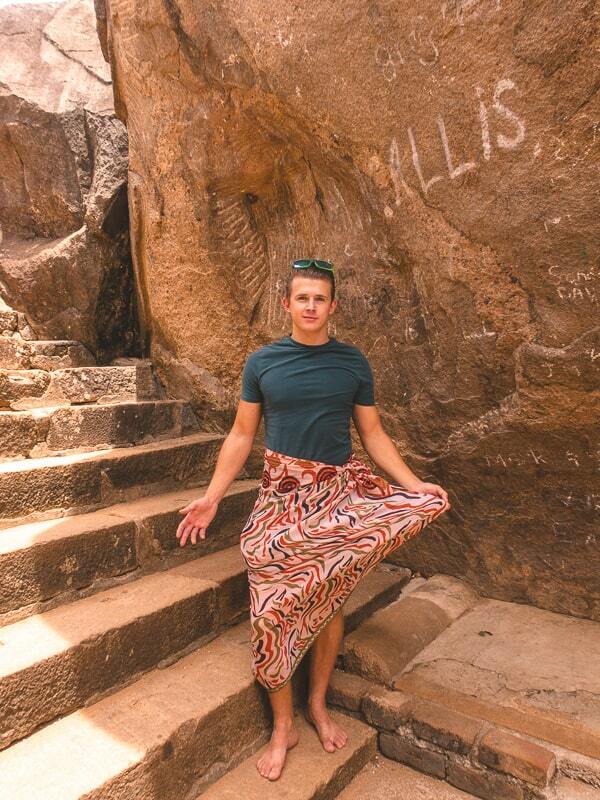 I had a wonderful time in this ancient city and I know you will too. 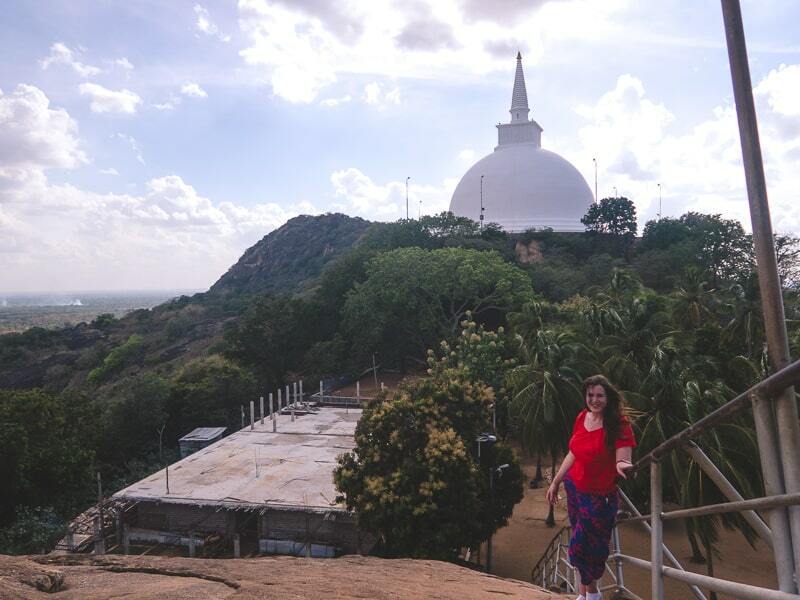 If you like history, then you’ll truly enjoy it, but if historical facts and figures aren’t your thing, then I don’t think Anuradhapura will be worth the money or trip for you! Comment below if you’ve been or you have other recommendations to add to the list. There are other places to visit in Anuradhapura that haven’t made the list. But, I think these are the must-sees if you are on a time constraint. Renting & Driving A Tuk Tuk Across Sri Lanka: Our Incredible Journey! Want great tours in Anuradhapura?